Choose Derrick Building Solutions for your Commercial or Design-Build Construction Project. Experience the Best Value, Enduring Quality and Peace of Mind. 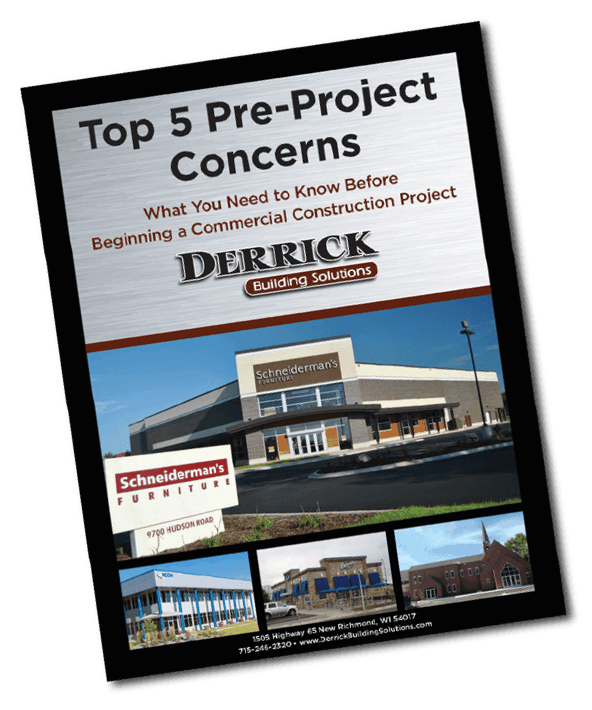 Derrick Building Solutions is a Design-Build General Contractor headquartered in New Richmond, Wisconsin specializing in commercial and industrial projects. Our firm partners with businesses and organizations throughout Western Wisconsin and Eastern Minnesota to develop facilities to meet their needs for years to come. Our projects are wide ranging including everything from office renovations to multi-million dollar new construction projects. Derrick Building Solutions has a reputation of quality, honesty, and trust. We are relationship driven and value integrity in all we do. We have a sense of pride in our work and are tenacious about exceeding our customer’s expectations. We will get it done right, on time, and on budget. That’s Derrick Built! We strive to consciously and strategically make positive impacts in the lives of others. Constructing specialized, manufacturing & warehousing space, retail projects, offices, banks, auto dealerships, healthcare, public facilities and more. Thinking about a construction or expansion project for your business? Start by downloading our helpful guide providing tips and useful information to save you time, money, and headaches.